The Committee for the inauguration of Imo 2019 governorship was inaugurated Tuesday by the Imo Governor-elect Rt. Hon Emeka Ihedioha. The Main Committee is made up of Barr. Chris Okewulonu-Chairman, Hon Jones Onyereri, Deputy Chairman, and Ray Emeana functions as the Secretary. The event which took place at the Rockview Hotel by 12pm had committees inaugurated. Each of the Committee is to be headed by a Chairman and Secretary. The Media and Publicity Committee which is headed by Dame Comfort Obi has 29 members among who is Bright Chimezie, Publisher of the `Nigerian Horn Group of newspapers. “It is with great honour and privilege that i address you today on the occasion of the inauguration of the Committee to plan the inauguation activities leading to the swearing in of the Governor – elect and Deputy Governor – elect of Imo State on May 29th 2019. This will mark the formal takeover of the government of the state by the newly democratically elected government. “On Wednesday 3rd April, 2019, I had the privilege of inaugurating a Transition Technical Committee, an assemblage of some of our best brains who are individually accomplished in their careers, to help us prepare a road map for governance based on the manifesto and plans we put before our people and feed back we received from our people during rhe campaigns that ensured our victory in the general elections. The unparalleled support and enthusiasm we have received from these eminent Imo sons and daughters have been humbling and indeed challenging. I appreciate the sacrifices they are making as they have since started work in earnest. “Imo people entrusted their mandate to us having won a keenly contested election, I must therefore congratulate all of us in a very special way for our sacrifices and resilience. Our victory was not an easy one. I must use this opportunity to re-dedicate and re-commit ourselves to providing good and purposeful leadership for our dear State. I can assure you that under our watch, Imo will rise again. “As we prepare to be sworn-in on 29th May, 2019, a few weeks from now, it has become pertinent to put together an inauguration Planning and Handover Committee, to prepare for a hitch-free exercise. “We took a deliberate decision to separate The Transition Technical Committee from the Inauguration Planning and Handover Committee. The reason is that the Transition Technical Committee is very busy with planning a roadmap for governance so that we will hit the ground running from May 29th. We did not want to burden this very important Committee with the task of organising the inauguration activities which is a statutory prerequisite for any new administration. “The Inauguration Planning and Handover Committee is charged with the responsibility of liaising with the existing government to ensure a smooth handover of power as has been done traditionally in Imo State. We intend to take off with an Interdenominational Church Service, Inaugural Lecture and other sundry activities specifically designed taking into consideration the sorry state of affairs of the State and the need to reflect the realities on the ground in Imo today. We want a sombre ceremony devoid of the usual pomp and pageantry heralding a new administration. “Of course, the PDP and Imo people are entitled to a little celebration of a hard won victory. A victory heralded as a liberation of the State from the shackles of bad governance, maladmnistration, destruction of the structures and institutions of representative government, nepotism, and absolute lack of due process in the way governmental business is conducted. We must however not over celebrate but rather get ready for the great and difficult task ahead. Imo State is in a hurry to recover and rebuild. “Ladies and gentlemen, you have been nominated after due consideration of your capacities, commitment to our great party and our dear state to serve as members of the Inauguration Planning and Handover Committee. The relatively large number of people involved is based on the enthusiasm and need for our people to get involved in governmental activities. In addition, the work of the Committee is basically voluntary with little or no remuneration. No government money is involved in this effort. I therefore charge you to put in your best in this patriotic call to serve. “As with the Transition Technical Committee, the Inauguration Planning and Handover Committee is subdivided into sub-committees to ensure effectiveness within the short time you have to work. I urge you to be committed and put in your initiative and resources to ensure that we organise a hitch free and historic handover activities. I have no doubt that with God on our side, we shall overcome. Former governor IkediOhakim and Achike Udenwa were in attendance. Others include: Dr. Douglas Acholonu (former Deputy Governor); Barr. 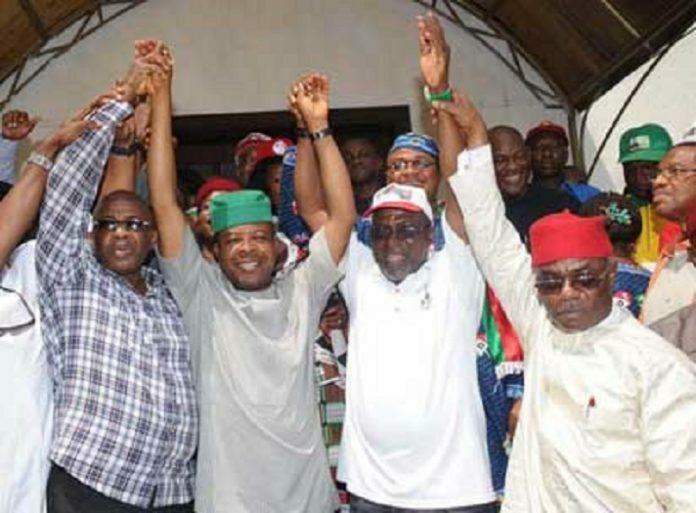 Charles Ezekwem (PDP state chairman) and several other PDP chieftains.